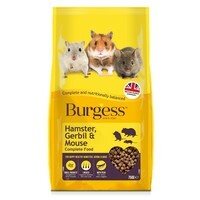 Burgess Hamster, Gerbil & Mouse Complete Food has been made with only the best quality ingredients to provide your pet with a complete and balanced diet. Designed specially for smaller mouths, Burgess Hamster, Gerbil & Mouse food has been made with tasty bite size nuggets that help avoid selective feeding, while still providing your pet with all of the vitamins, minerals and nutrients they require. Poirot just loves his grub and will eat anything!! I was not happy with the previous mixed food I had bought him as it grew mouldy in the sealed container quickly. Well this stuff is a superior mix, much more variety especially in the flakes (his fave). He doesn't leave a crumb...cheek pouches bulging to the limit!! Will definitely be buying more.